You dont need to be mad but it helps. Fellrunners have often been described as weird ,crazy or just downright odd. No matter when you get to the main cairn on Scafell Pike it is always busy. This year's fell race to the top and back was no different. 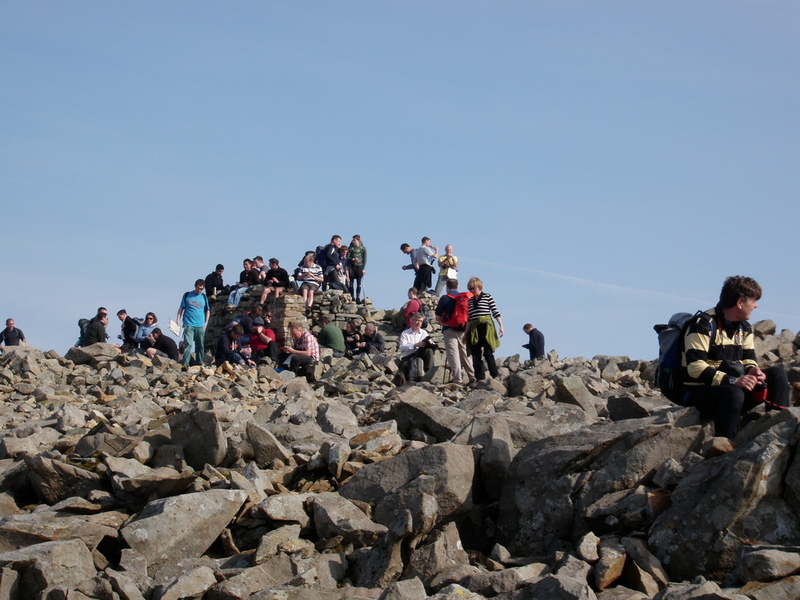 Lots of walkers on the main path made descending on the way back down interesting. I had a pretty good race and battled to get 1st Vet 40 which I was well pleased with. 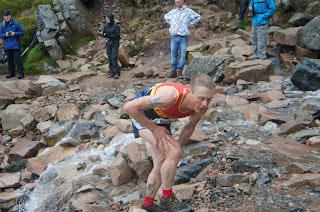 The race is the classic up and down short fell race with every type of terrain thrown in but lots of rock which I love. As a pretty Non Judgemental type person maybe I am guilty in seeing the good in everyone. But it seems that in the male dominated world of Road Cycling we have a minority of guys that seem to just, well have a laugh when they come across a woman on a road bike and really really are not being good. Maybe I am just a gentleman. Tell me it doesn't happen and I will tell you I have seen it. I have even heard it from Female Roadies. Three MEN cyclists are out in front. Oh we can all ride at twenty five miles an hour eh lads. To catch up and try and have a chat with the three guys whom she has never met before. Will they be accepting and allow Joanne into their little world of proper bikes and correct ways of riding. ( Ive seen it and heard it). There was a comment on the fellrunner forum about a bloke not speaking to another male rider. What chance has Joanne got?. ( Ive seen it and heard it ) and in fellraces. So pretty negative. I know I know most men will be accepting and welcoming but there does need to be a change. I was riding in a group with a Joanne a while back and after a few miles it was her turn to ride point which she duly accepted and took her turn and went on the front and pulled us along nicely. I was amazed at the difference in attitude when the guys realised that actually she was strong enough and willing enough to just not want to be towed around but to be treated as an equal. Play the game and lets really start to promote the Women who try desperately hard to get recognition in our sport. Lets do our bit. Yes at this current time the ration is probably about 1 in 20 riders you see are Women. Comment: Is there any point to dreaming big? Between now and the end of 2012 cyclingweekly.co.uk will be inviting people to write their thoughts on the issues facing the women's cycle racing scene. Our first piece is by former junior national champion Louise Mahe. After an amazing women's Olympic road race, hailed by many as aggressive and entertaining, everyone thought the interest and sponsorship around women's racing could only improve. But it's almost done the opposite and gone back to the same post Olympic lull that happened after Athens and then Beijing. Recent news of AA Drink dropping their sponsorship of the women's team that backs many Olympians, including Britain's silver medalist Lizzie Armitstead, has shocked many involved in women's cycling. Such news not only affects the best riders in the world, it filters down to national, and even local level. The up and coming riders, inspired after watching the success in the Olympics, begin to question the feasibility of chasing that dream. In 2005 when I was 16, I became Junior Road Race National Champion and a year later went on to podium at the under-23 Nationals Road Race Championships. I dropped out of cycling the next year. I hadn't made it firmly on to the British Olympic Development Programme, despite my consistent results, and was left somewhat disillusioned. This season I have begun finding my legs in national level races again. Although my success has been limited, knowing I've achieved results despite missing my winter base training has inspired me. It's also got me thinking that maybe I can fulfill my childhood dreams of racing at World and Olympic level. But what hope do I have as an amateur cyclist dreaming of success and wanting to go pro when the current Olympic medal winners are struggling to find sponsorship? With many of the top pro riders in the women's peloton going public about the inequality and frustration they feel occurs in cycling it looks like it's going to be an uphill battle. I am currently riding for Mule Bar Girls and race locally and nationally with my team. We get kit, helmets, national race entry fees paid and are self sufficient in our approach to organising our racing. The next step up in my racing would be to dominate the British road scene and then go and race abroad as much as possible next year. To take this step would be harder financially too, as I would have the same backing from my team but will be traveling and racing even more than this year. To be honest this is the same for most riders, male and female. They do this in the hope of performing well and getting noticed by a bigger team. But for women, a bigger team often doesn't mean a bigger budget so this self-sufficiency often doesn't end. So is it even worth it? Current women's world road race champion Giorgia Bronzini (Italy) was famously quoted saying how she would not advise women to start cycling seriously as it is so hard to pursue a career at the top. That really brings home the enormity of the problems female cyclists face. But why is it so hard at the top? Many riders and team managers are calling for the UCI to do something about the lack of support and sponsorship. After a call for the UCI to guarantee a minimum wage for riders of pro Women's teams, similar to that of their male counterparts, Pat McQuaid said that the sport was not developed enough. This is an extremely negative attitude from the UCI President, but in a way I can understand this view: there's no point forcing sponsors to pay riders more, what we need is sponsor actually wanting to pay riders at all. So what will I do? At the moment I'm fresh out of university, on the search for a ‘proper' job. I do feel I need to give cycling a real go, so hopefully I can find a job that allows me to get a solid winter base so I can build on this seasons' results. Then I'll just have to see how it all goes. I know it's going to be a struggle, but hopefully by the time I get to that top level things will have changed. And if not I'll perhaps be one of the riders that can help make a change, ready for the next generation. IPC Media Limited, owner of cyclingweekly.co.uk, will collect this information solely to process your request. Possibly for me the memory highlight in a cycling packed year. But there is a problem still in cycling and I am not talking about doping. Women's cycling for me has huge potential. Whenever I ask a fellow rider on what they think of women's cycling at the top level, a lot of them just simply reply well women are something nice to look at on a bike !!! !, Hey what ?. This really winds me up. For too long now women have had to put up with a rubbish infrastructure, crap pay, poor exposure, lack of interest, and a general well its only women attitude. Well its time it changed. Women should have a system in place that treats them equal to the men in cycle racing. The UCI or Pat and his cronies need to start getting real. They have done virtually nothing to promote the sport of Professional Women's Racing. Teams come and go and what incentive does that give to an up and coming young female rider. The pay they receive is a pittance. Hey SKY. what about sorting out a Pro Cycling Team. I have personally asked Dave Brailsford this and Shane Sutton. Both replied that it is out of their hands. SKY could fund a Women's Team on the back of half a days profit. So why not ???. Is it too risky = Hey whats to lose, the public love cycling and I am confident they would watch it more if it was just actually known about and covered more. At the moment some of our best Female cyclists are struggling to make their way in the sport whilst the likes of Cavendish, Wiggins and many of the young SKY riders and other riders on British teams make a very good living. We have had a fantastic year and right up until just after the Tour of Britain I was thinking hey come on SKY announce a bloody women's PRO cycling team. Its all gone quiet though. I say cut the men's team in half and form a women's team whilst they have the chance. The Three Shires Fell race was a huge learning curve for me when I first tackled it. I have done the route a few times since mind and it has got easier. 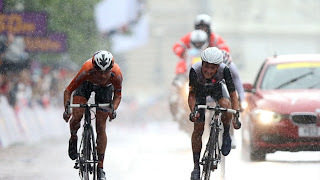 Basically there a three tough climbs whereby if you want to do well you have to give your all and go as hard as you can. The downhills will take care of them self. I wanted to do well on this one and I was super motivated after getting back into my training after the Ben Nevis race which did not go all to plan. The start was steady enough and I was at the front of the second group climbing up to Wetherlam and as we topped out I found myself with Paul Cornforth of Borrowdale Fell Runners. We just worked together all the way round and didn't see anyone else until Dave Wilby from Ilkley Harriers joined us at the last climb. The run in back to the Three Shires pub was near enough and I was happy to finish behind those two who were stronger than me on the run in. 5th place which I was more than happy with. Conditions on the route were perfect and the sun came out at the end. A pasty and a nice diet coke paid for by my team mate Hanno. The Ben Nevis race is a special one. I try my hardest every time I do it but this year I knew on the way down the road I would not be as strong as last year. I had not done the same amount of training and as soon as I started to climb i could feel it in my legs. The weather on the upper part of the mountain was very windy and by the time I handed the summit marshal my tag I was frozen. I couldnt descend like I normally do and the wet rocks didnt help matters and by the time I pulled out of the beck to start the final run down the lower slopes my legs were gone. I made a mistake going down one of the shortcuts on the path and was glad to see the finish field. Some fantastic performances from the Penniners that travelled up. The weather was not great but it was a brilliant weekend. My good friend Andy Fleet managing to win the Under 23 prize. I was made up for him. So I will be back next year to try it all again. 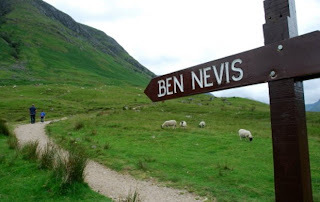 The Ben Nevis Race as usual lived up to all its expectations. 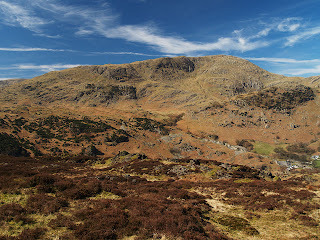 I am a runner with a passion for the fells. I run most days with my dog a collie called badger. Based in Ilkeston means im not ideally placed for the fells but have the Peak District pretty close and the Lake District a couple of hours away. I cycle as well but have a love hate relationship with the bike. Whilst i train to race and keep pretty competitive as my blog title says. I remain pretty laid back about it all.